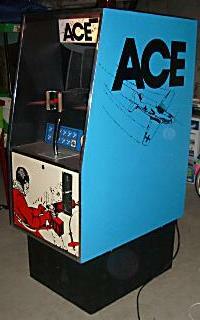 Description: Ace, MCI (Milwaukee Coin Industries), 1970s (exact date unknown), came in two cabinet style (large and larger), project style WW2 gun game. 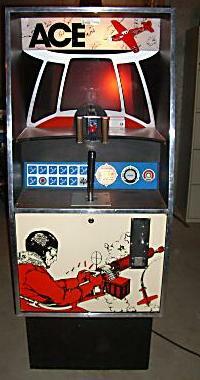 One player only, a joystick for flying and shooting. 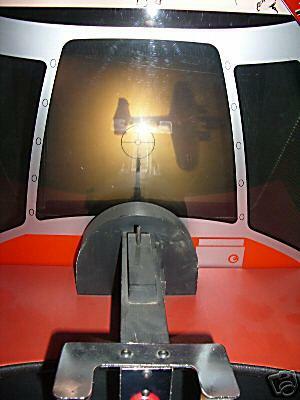 Keep finger pressed on the machine gun to down enemy planes. Electronic sounds include machine gun rat-tat-tat and explosions from planes that are hit and crashing. Flashing lights indicate hits. Scoring is kept on front of game by lighting up number of "kills". Lots of kills earns you "ACE" status. This is the smaller version of the game. Pics from Fibbleflip.